Suraiya Amber White started going by her middle name in fourth grade to fit in, when her family moved to Wisconsin. Amber’s mother is from Lebanon and wears a hijab, but she has always allowed Amber to decide for herself in religious matters. Academics and extracurriculars are another story. Both of Amber’s parents – but especially her mother – push her to excel in all subjects and to join as many clubs as possible so she will be guaranteed to succeed in life. At times she feels like a break dancer about to fall on her face. 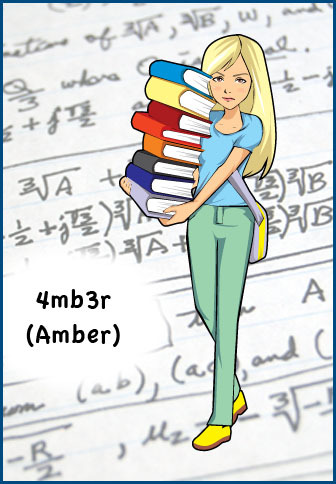 Still, she discovered her love for algebra early on. She loves the sense of balance and control she gets from moving numbers and letters around on either side of an equals sign.